Contact the Atidan team at nintex@atidan.com for a demonstration, pricing and additional information. Empower more users to automate their own processes in minutes through intuitive, easy to use, browser based drag-and-drop workflow designer. Get real work done in Office 365. Protect your investment through simple deployment and management, while avoiding additional infrastructure and client software costs. 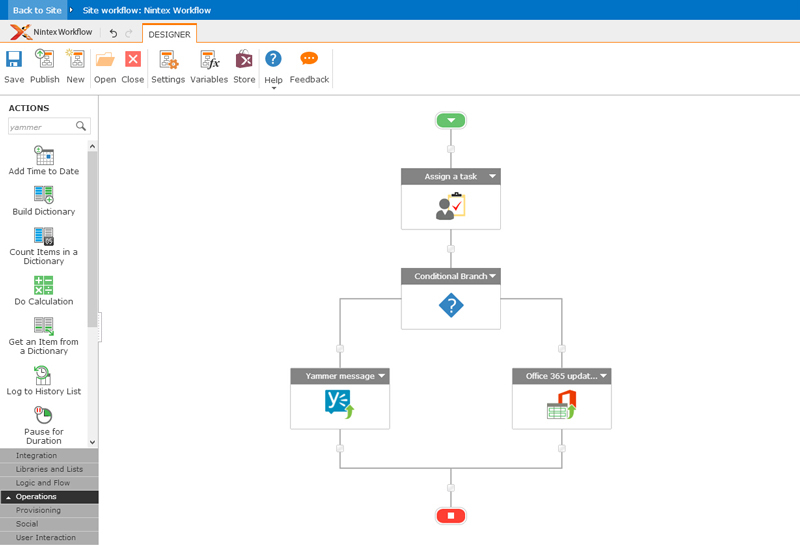 Connect Nintex Workflow to Office 365, external systems, Exchange server, Lync server, databases, web services, and a world of cloud services seamlessly. By taking full advantage of the new cloud app model, Nintex has enabled seamless integration with Office 365. Now you can scale and build advanced workflows on a robust platform. Stay productive wherever you are by integrating and connecting to a host of cloud services in real-time including Yammer, Box, Twitter, virtual machines and other applications. You can quickly add web services to workflows without writing a single line of code; and publish forms to collaborate with external vendors, partners, and customers. With Nintex Workflow for Office 365, we’ve introduced Nintex Store, a one stop shop for all your workflow action needs. Nintex Store contains hundreds of actions for you to build integrated, document-centric, and SharePoint-centric workflows that help you drive your business. Seamlessly connect Nintex Workflow to external systems such as Microsoft Dynamics CRM, web services, and applications most relevant to your business. Business users and IT professionals alike will be empowered to quickly and easily automate business processes; from simple reviews and approvals to complex integration across external applications, cloud services, social media, and data sources. Leverage a wealth of actions to support everyday processes across a variety of industrial sectors and company departments, such as provisioning, help desk, leave requests, travel requests, expense claims, maintenance forms, and more. Nintex Workflow for Office 365 is easy to install, use and manage – plus, you can activate the app in seconds and get to work immediately. The new cloud app model means improved portability, flexibility, and scalability for all your applications and documents residing in Office 365. Coming soon in the SharePoint store, Nintex Forms for Office 365 will empower users to publish web and mobile enabled forms using Nintex Live, so that your mobile workforce, customers, and vendors can interact with your existing processes and systems.